FIBA was established in 1953 and the initial season matches were played in Chile. It is a women’s basketball tournament in which the national teams from all over the world participate. This tournament takes place every four years. It was held for the first time only three years after the men’s basketball championship. 16 different teams take part in this tournament and according to the statistics, only 4 countries have succeeded in winning the tournament. These countries are Brazil and Australia, and both of them were winners once, the Soviet Union with 6 titles and The USA with 10. The USA is the current title winner from 2018. When the Olympic Games sports are concerned, women’s basketball found its place there. The first men’s basketball tournament was held in 1936, whereas the first women’s tournament took place 40 years later, in 1976 during the Summer Olympics. The Soviet Union won the first two tournaments, the USA was the winner eight times and the Unified Team, which was formed only for the 1992 Olympics and consisting of 12 former Soviet republics, won this tournament that year. EuroLeague Women is the tournament that FIBA Europe organizes. The first season of this competition was played in 1958 and starting from then, it is being organized every year. 16 teams compete for the title divided into groups. The top three countries of this competition are the Soviet Union, with 18 titles, Italy with 11 and Russia with 10. Taking clubs into account, the three most successful were TTT Riga (Latvia), with 18 titles, Vicenza (Italy) with 5 and Spartak Moscow Region (Russia) winning 4 times. This league from the United States, precisely North America, was founded by David Stern in 1996, with the first season played one year after the founding. 12 teams participate in this league and the competitions are held annually, from May to September. The names of the clubs that this league consists of are: Chicago Sky, Connecticut Sun, Dallas Wings, Las Vegas Aces, Los Angeles Sparks, Minnesota Lynx, New York Liberty, Phoenix Mercury, Seattle Storm, The Atlanta Dream, The Indiana Fever, and Washington Mystics. NCAA Women’s Division I Basketball Championship is a tournament that takes place once a year (in March) in North American colleges. This tournament was founded in 1982. Basketball was one of the twelve sports played during NCAA championship. 64 teams compete for playing the tournament in March, and 32 of them automatically win the right to participate in the tournament. In the beginning, people were skeptic about women’s basketball, but with its rise, this sport becomes more and more popular among the sports fans. 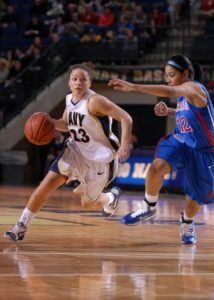 The reason for its popularity lies in the fact that women’s basketball tournaments become more frequently covered by media.